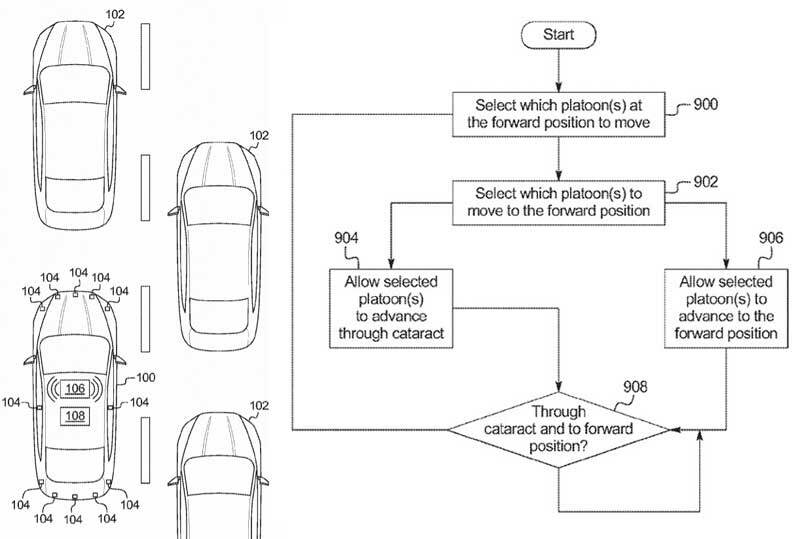 Ford Global Technologies, LLC, a subsidiary of Ford, has received a patent titled “Vehicle-to-Vehicle cooperation to marshal traffic” for a system which facilitates cars on road to communicate with each other using cyrptocurrencies and reducing traffic. The new “apparatus” involves a token exchange in order to provide a smoother traffic organisation, and according to the US Patent and Trademark Office (USPTO). According to the patent filing, “Traffic congestion occurs when one or more lanes of a multilane road are blocked, for example, because of a construction or an accident” and the disorganisation in traffic is caused when “reduced traffic flow is compounded by the psychology of human drivers who focus on their individual travel time preferences“. The document published Tuesday details a Cooperatively Managed Merge and Pass (CMMP) system in which "driving behaviour is monitored, recorded, and evaluated in a collective manner”. This means vehicles will communicate and cooperate with each other to make traffic more efficient and organises the vehicles, namely Cooperative Adaptive Cruise Control (CACC) in order to connect with other cars through CMMP tokens. The system divides participating vehicles in two categories: ‘merchant vehicles’ and ‘consumer vehicles’. Vehicles that allow other vehicles to pass are considered merchant vehicles, while the vehicles that request the pass are called consumer vehicles. "This system would temporarily allow for particular cooperative vehicles (sometimes referred to as 'consumer vehicles') to drive at higher speeds in less-occupied lanes of traffic and also to merge and pass freely when needed. Other participating cooperative vehicles (sometimes referred to as 'merchant vehicles') voluntarily occupy slower lanes of traffic to [allow] the consumer vehicle to merge into their lanes and pass as needed." How do cryptocurrencies play a part in this system? "The CMMP system operates with individual token-based transactions, where the merchant vehicles and the consumers' vehicles agree to trade units of cryptocurrency (sometimes referred to as 'CMMP tokens'). The CMMP tokens are used to validate and authorise a transaction in which, at consumer vehicles' request, the merchant vehicles either occupy slower lanes of traffic themselves, or allow the consumer vehicle to merge into their own lane and pass as necessary."